Here at the Philadelphia Water Department, we tend to think of all of our smart stormwater solutions as works of art, but sometimes we like to bring true artists on board to help highlight and enhance our work in communities. This is your page for all things art when it comes to PWD's creative collaborations. Check back here for the latest news on our art partnerships. Philly Water Art: Infrastructure Enhanced with Community Art. Venice Island is located between the Manayunk Canal and the Schuylkill River, between the Lock Street and Cotton Street bridges in the Manayunk neighborhood of Philadelphia. The vinyl artwork of Waterways graces the steps at the Venice Island Performing Arts and Recreation Center. 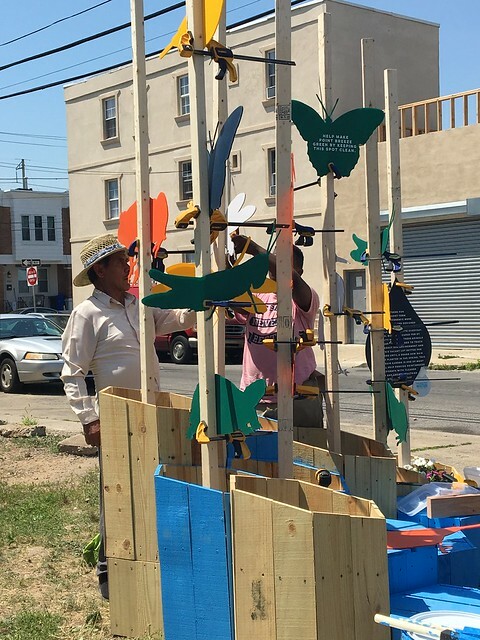 Philadelphia Water is bringing the power of public art to its nationally acclaimed stormwater management program in a new partnership with the City of Philadelphia Mural Arts Program that marks several firsts for the city. Waterways, a work of temporary public art sponsored by Philadelphia Water for the city’s Manayunk neighborhood, is one of the largest public street art installations ever tackled by Mural Arts and the first of this magnitude to utilize vinyl as the medium. Local artist Eurhi Jones was commissioned by Mural Arts to design the piece. Stretching across roughly 10 blocks from Pretzel Park in the heart of Manayunk all the way down to Venice Island on the Schuylkill River, the artwork’s exciting imagery and bold colors act as a series of “wayfinding” steppingstones with over 50 individual pieces that pay homage to the area’s industrial history and wildlife such as herons, shad and crayfish while highlighting Philadelphia Water’s groundbreaking stormwater innovations on Venice Island. Installation began during the first week of May. Get a sneak peek of Waterways here. There will be a public celebration of the work at 6 p.m. on Thursday, May 14 at Main and Lock streets, where the final piece of art will be unveiled. A public tour of the entire installation will follow, with free ice cream for all to enjoy. The press is also invited to a private walking tour of Waterways with Philadelphia Water and the artist at 2 p.m. 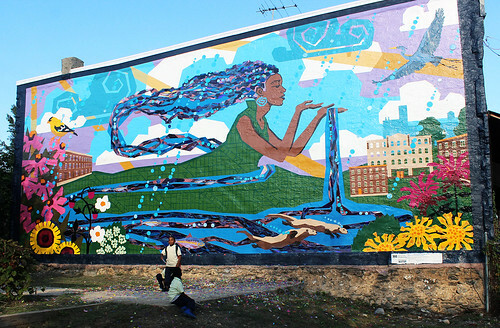 The collaboration between Philadelphia Water and Mural Arts promotes the power of art to enhance community connections to Venice Island, the Manayunk Canal and the Schuylkill River. Completed in the fall of 2014 with the support of Philadelphia Parks and Recreation and the Manayunk Development Corporation, the new amenities at Venice Island include stormwater -slowing tree planters , a pump house with a green roof, and an innovative subsurface basin that can prevent nearly four million gallons of untreated water from entering the Schuylkill during heavy rains. Venice Island not only protects and improves the environmental health of the Schuylkill River, but it also includes a full-scale reconstruction of the recreational facilities and community amenities, including the new Venice Island Performing Arts and Recreation Center, basketball courts and a new parking lot. Given the scale of improvements made at Venice Island and investment in the invaluable natural resources of the Schuylkill River and Manayunk Canal, the sprawling nature of Waterways makes for a fitting pairing. The vinyl artwork was fabricated and installed by sign&design inc., and brings the artist’s vision to life. We invite you to come visit Manayunk, explore Venice Island, and let the Waterways be your guide! Follow along on social media: @PhillyH20 on Twitter and Instagram and Facebook.com/PhillyH2O and use #phillywaterart to see what is being posted! Eurhi Jones attended Wesleyan University and the Pennsylvania Academy of the Fine Arts. Her work in painting and mixed media sculpture has been shown in venues such as the Asian Arts Initiative, Abington Art Center, the Main Line Art Center and the Pennsylvania Academy of the Fine Arts. She has worked with the Mural Arts Program since 1999, creating 17 murals in the Philadelphia area, notably at the Philadelphia Zoo, the Please Touch Museum and Bodine High School. She lives in Belmont Hills with her husband, fellow artist David McShane and their two daughters.